Last night, I discussed an American twist on the witch's legendary power of shapeshifting (the "slip-skin" belief). As I said then, shapeshifting and witchcraft are intimately entwined, no matter the variations by culture and region. But while the legend of witches' shapeshifting comes with many permutations, their ability to shapeshift others is pretty cut-and-dried and remains steady to this day; the concept of witches turning others into animals is so steadfast that it still appears in pop-culture - children's cartoons and books are filled with it and it serves as the plot device for many. One interesting take on this theme is that of being "ridden by a witch." While pop-culture often depicts witches riding broomsticks, the folklore source most often mentions them shapeshifting objects, including humans, to ride. In one folktale, an American describes how a witch entered his home one night while he was in bed. As he got up to fend her off, she drew a bit and in the ensuing melee, managed to bridle him! As he was circling with the witch astride, he saw his legs becoming hindquarters and soon realized he had been transformed into a mule, which the witch rode to carry out her nefarious deeds (which, in this story, was meeting bank robbers). This activity continued for several nights. The man approached a Witch-Master, who told him to mark the cave where the witch was taking him so he could kill the witch with a silver bullet and the two of them could take the loot. So the following night, when the witch had bridled and ridden him to the same cave they'd been visiting, he "jest drapped as many drappin's as [he] could, an' started in for t'chaw me a good big blaze on th' white-oak saplin', like [the Witch-Master] told me..."
He ends the story by saying he awoke in the morning to find he'd shat the bed and "dang near bit th' ol' woman's laig off!" While a humorous take on the matter, the recorder of this tale notes that her aunt took her aside afterward and assured her the man telling it believed in witches and witchcraft "deep down in his heart," but would never admit it to any but his closest friends. In all of these tales, the witch strikes when the victim is nearly asleep - drifting into that gray state where one starts dreaming but is still technically awake. The dreams one experiences are generally tied to stimuli in the immediate area. This period is notable in all folklore, as well as Occult practices, lucid dreaming, and psychology. 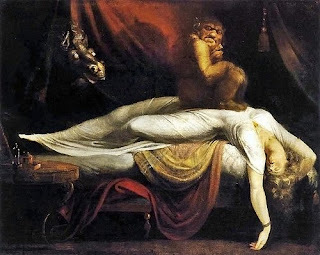 This is the state in which "sleep paralysis" occurs - a phenomenon which was tied to witchcraft and called "riding." It was so prevalent a belief that Henri Fuseli even painted a famous piece based on the concept. This gray state is the "in-between" area amidst full consciousness and sleep; all "in-between" areas - passages, doorways, etc. - are said to hold great power, as they are literally portals between our world and that of the Unseen. With this tale, you can see how this legend was built upon as it traveled across cultures.